Long and thin, Filament doesn’t quite have near-neighbour Cult Espresso’s advantage of actually being a coffee shop in a corridor, but nonetheless, it’s very corridor-like, with possibly the greatest ratio of depth to width of any coffee shop I’ve been in. It’s not so narrow that I could touch both walls with outstretched arms (it’s maybe twice that wide) but it goes back a long way. Naturally, this raises concerns about the light, but fortunately, the front’s all glass, with a window at the back, so it’s surprisingly bright, with plenty of bare light-bulbs (which you’d expect from somewhere called Filament) to supplement the natural light. Sensibly, the walls and ceiling are painted white, which helps immensely, and, since it’s almost as tall as it is wide, it feels really spacious. The furniture’s very much dictated by the space. There’s a window-bench on the right, which runs from the door (on the left) to the wall. The counter takes up the front third of the store on the right-hand side, with the short end facing the window. This holds the EK-43 and filter bar, while the length of the counter holds the cakes/bagels (on the corner) followed by till, grinder and espresso machine. Just behind/beyond the end of the counter are some shelves which look suspiciously like planks resting on scaffolding poles sticking out from the walls. These hold jars of loose-leaf tea, fresh vegetables (for the smoothies) and bottles of water/glasses. These. Opposite the counter is a long, narrow bench against the left-hand wall. The bench (which looks for all the world like a plank supported by scaffolding poles) has two equally-narrow tables, each of which looks suspiciously like a plank stuck on top of two scaffolding poles. Next, beyond the retail shelves (planks resting on scaffolding poles, anyone? ), the store narrows slightly on the left, just in time for a single, round table, followed by an old wooden bench seat. Opposite these, beyond the end of the counter against the right-hand wall, is another long bench with another two narrow, scaffolding/plank tables, plus fixed benches (I’m sure you can work out how these have been constructed). Filament narrows even further opposite the second of these two tables. The space is taken up by the toilet and there’s a little bench seat (scaffolding/planks, anyone?) running along the left-hand wall and across the window at the back. All these seats are comfortable enough, but if you have any problems with your back, they’re really not for lingering on (and I speak from experience!). I’d just come from having one too many cups of coffee at Stag Espresso and, needing to soak up the excess caffeine, had the very last onion bagel which was toasted to absolute perfection. For my coffee, I was drawn to Obadiah, a relatively new roaster, which is based in Edinburgh, but with the coffee roasted in Sofia, Bulgaria. 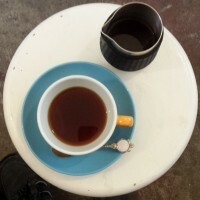 I had an Aeropress of Obadiah’s single-origin Ethiopian. This was a perfectly acceptable cup, which held its own even when cold (I stretched it out, having really overdone it at Stag Espresso; with hindsight, I should have ordered and eaten the bagel and then gone back for the coffee). It definitely evolved as it cooled, being quite fruity and punchy when cold, which came as a pleasant surprise. You can also see what Edinburgh-based blogger Claire makes of Filament on her blog, There Goes Claire. This entry was posted in Cake, Coffee Shops, Edinburgh, Evening Opening, Laptop Friendly and tagged include by Brian Williams. Bookmark the permalink. Speaking of latte art -is there a CSA for best latte art(ist) yet? If not, one for 2016 perhaps?